Rockville's Mayor and Council voted 3-1 to approve a school test waiver for developer B.F. Saul's Wegmans-anchored Twinbrook Quarter project last night, after delaying the controversial decision for nearly two months. Councilmember Beryl Feinberg was the sole dissenter casting a "No" vote. The waiver concept won support from Mayor Bridget Donnell Newton, who had opposed Councilmember Mark Pierzchala's original proposal, which would have amended the city's Adequate Public Facilities Standards to allow schools in targeted areas of Rockville to have student populations at 150% of capacity. The meeting's regularly-scheduled Community Forum became another public hearing on the question, with the vast majority of residents again opposing loosening student overcrowding standards. A large number of parents of students attending Farmland Elementary School turned out, as that already-overcrowded school is currently slated to receive a portion of the students who would be generated by the Twinbrook Quarter project, and others in that area. Many parents became emotional as they described existing conditions at the jampacked school. "We are in a crisis mode at Farmland," one said with tears in her eyes. A father who brought his Farmland first grader to the meeting told the Mayor and Council of a "heartbreaking" conversation he had with his son just before the meeting started. He asked his son what his school environment was like, and his son "just looked at the ground and said, 'It's so crowded.'" The father noted that the boy's large class size prevents him from getting the extra help he needs with reading. Among those favoring loosening standards were a millennial seeking more housing, and representatives of the Twinbrook neighborhood, which B.F. Saul has worked with for several years as the project moved forward. In the end, there would be no across-the-board 150% standard, as a new waiver alternative was developed over the last week. But the full impact of the waiver and the new precedent on school overcrowding were not immediately clear. Newton and Feinberg complained that important elements of the proposal were left out of the documents given to the Mayor and Council Monday by staff, such as the stipulation that any additional units proposed for the project in future amendments would have the school test applied to them. Newton announced at the outset of the discussion that the city would be forming a committee or work group to avoid a rushed process like this in the future. She said that among her goals were to avoid increasing the overcrowding standard above the current 120% of capacity, to seek boundary changes that would direct new students generated at Twinbrook Quarter to the Rockville High School cluster, and to remove the Town Center as a zone where weaker school capacity standards might apply. Feinberg was not placated by this, and the meeting featured a rare disagreement between her and the Mayor that became mildly pointed at times. Noting that the waiver didn't require anything additional beyond what B.F. Saul was already required to provide for a "Champion Project," Feinberg said, "They are not doing anything extra." She disputed Newton's citation of a potential $70 million in revenue from Twinbrook Quarter to city coffers, arguing that "we have never received any documentation validating those numbers. Ever. " B.F. Saul's Todd Pearson said the documentation was submitted to the Mayor and Council, but Feinberg said it was never forwarded to her. Lowering the boom on the deal when it was apparent it would pass, Feinberg blasted it on several fronts. 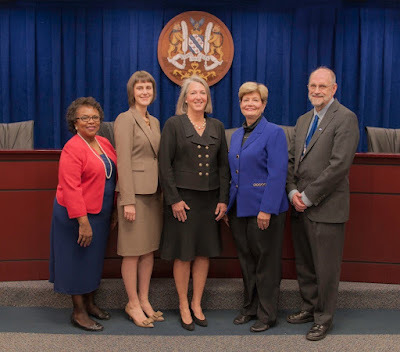 Approving the waiver "sends the message that Rockville prioritizes development over our children's education," she said. Feinberg noted that Richard Montgomery High School has run out of extra classrooms it can convert to science labs, which will hurt science learning among the 1100 new students that could be added to the school in the coming years, if development could avoid moratorium. Turning back to the issue that residents were getting nothing extra in exchange for the waiver, Feinberg asked, "What are we getting for this?" She then asked Pearson if B.F. Saul would provide 20,000 SF of public space as a condition for the waiver, but he was unable to make such a commitment last night. Feinberg also raised potential legal issues. "This is clearly a carve-out for a developer, and one developer only," she said, adding that the city was now giving B.F. Saul "most-favored developer status." Now other developers will seek similar "gimmees" in the future, she predicted, and sue if they don't get them. A potential candidate for mayor this November, Feinberg made clear she would vote no on the waiver, closing her speech by declaring, "Not with my vote, not on my watch." Seeking to correct the record on a few points as the question was called, Feinberg was cut off by Newton, leading to another testy exchange as officials faced arguably the most unpleasant vote of this term. "I don't appreciate being cut off," Feinberg said. "You cut off all of us last Monday," Newton replied, "so I resent that comment." When the vote was taken, the waiver was approved 3-1, with Newton, Pierzchala and Councilmember Virginia Onley voting in favor, and Feinberg opposed. Newton said at her victory party in 2015 that she did not plan to run for mayor again. While a solid supporter of more-responsibly-managed growth, as evidenced by her appointments to the Planning Commission, Newton has long supported the Twinbrook Quarter project. Beneath the apparent drama on the surface, last night's events made sense politically for each elected official. Newton achieved a compromise, was able to advance a project seen as an accomplishment of her tenure as mayor, and won't have to face voters angry about the impact on schools this fall. Feinberg made it abundantly clear she was the defender of students and parents in this battle, while Pierzchala and Onley retained their pro-development bonafides. This sets up another election of contrasts this fall, even as speculation swirls about who will run for Mayor and Council. Let's cut the the chase shall we. Are you against the new development and in favor of the limits to school population limits? If the Council had voted the other way, Dyer would have blamed them for losing Wegmans. Exceptionally good news. That section of the Pike will go from dilapidated to a destination that pulls from the entire area. People are obsessed with Wegmans. The overcrowding is an issue that needs to be addressed; MCPS needs to maintain the current timeline of building a new highschool to alleviate RM/RHS. But keeping Twinbrook run down wouldn't solve anything. "A father who brought his Farmland first grader to the meeting told the Mayor and Council of a "heartbreaking" conversation he had with his son just before the meeting started. He asked his son what his school environment was like, and his son "just looked at the ground and said, 'It's so crowded.'" A snowflake raising a snowflake. "1100 new students that could be added to [Richard Montgomery High School] in the coming years, if development could avoid moratorium." The program capacity of RM is currently roughly 2200 so a 150 percent utilization nets another 1100 students. However, these developments in the RTS and South Pike performance areas would never generate that many students. Based on MCPS student-generation rates, we would need 35,000 multi-family dwelling units and there is simply not enough zoning for that. Councilmember Feinberg deliberately inflamed fears among parents and the community by pedaling that specious number. The Twinbrook you envision will benefit from the fruits of this development as much as Lincoln Park benefited from RTC. None! Metro and the C&O RxR are barriers to these communities. Twinbrook will remain a low-class community for the foreseeable future. Not only is this project important because it's next to the metro and replaces multiple square blocks of single story car-centric crap, but it also builds a pedestrian connection to that underserved and cut off portion of "old" Twinbrook. It will completely change the amenity quality and access for both sides of the track. As I recall from the last meeting I attended, there was no commitment whatsoever to build a pedestrian crossing. They more or less said they would be open to conversations with WMATA about extending the platform. Nothing else. Also, low class is a little odd. I would say we may not be Nobel laureates but we do fine for ourselves. Only in MoCo is a neighborhood where homes sell for $400K considered "low-class." In fact, it's the neighborhood's desire to remain (relatively)affordable. Increasing the amount of housing helps achieve this, while also reducing the pressure on the existing single-family homes to take in basement borders and become essentially unregulated multi-family dwellings. Mayor and Council did the right thing by allowing this project to advance. Pretty good reporting from Dyer. Thorough and objective, with actual quotes and facts. Why can't all his articles be like this? In my opinion, the waiver is necessary. That side of Rockville Pike is disorganized hodgepodge of random retailers that seem to change on a monthly basis, in addition to the 37th Mattress Firm on the Pike and the shuttered Hooters. I hope the Salvation Army store is included in the new development. CVS should also stick around. Pretty good reporting from Dyer. The biggest issue I have with this article is that the title is wrong: “Mayor & Council approve school test waiver for B.F. Saul's Wegmans-anchored Twinbrook Quarter project.” The Mayor and Council did not approve a “waiver,” but rather an “exemption.” This error cascaded through the piece. When it comes to this process, a waiver and an exemption are quite different from each other.